Provide comfort for the family of Earl McBride with a meaningful gesture of sympathy. It is with heavy hearts we announce the passing of Earl McBride on Monday, April 8, 2019 in Innisfail at the age of 92 years. 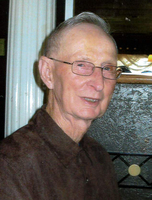 Earl was born April 10, 1926 in Innisfail (Grahamston area) to Joseph and Sarah McBride. As a young boy his favorite subject was history. Dad enjoyed Rugby, Fox and Goose, but baseball was the favorite. He was a fan of Babe Ruth. Every Sunday family and friends would meet at the homestead to play ball. He liked to be a snappy dresser with suit and tie when off to town with his brothers. Dad worked at various jobs as a young man, at the Penhold Airport, Western Natural Gas, Bennett & White Construction with his brother Art, Holt Farms, Gunstan Ranch, and Johnny Niblock farm. Dad had a love for cars some of his favorites were Model T Ford, 4-90 Chev, Model A – 29. He met Isabel Mary McLeod in Red Deer in 1948 and they married in Red Deer in 1950. Dad had a passion for farming and east of Innisfail is where they started their farm and family. Love you a big dish full and a wee spoonful too. To send flowers in memory of Earl Clifford McBride, please visit our Heartfelt Sympathies Store.